Background: Clinical diagnosis often relies on imaging modalities. However, in many cases the palpating hand is more sensitive to suspicious lesions than million-dollar expensive hardware. This is due to the incredible wide range of the shear modulus in the body: From fluids to bone – the shear modulus spans over more than eight orders of magnitude. This large variation of values is unique in solid-state physics, in particular regarding living systems. Therefore elastography has been invented which brings the measurement of mechanical constants into the workscope of physicians. Problem: Little is known about the relationship between micro-structure and the macroscopical mechanical behavior of soft biological tissues. Many biological systems are built by ordered hierarchical structures integrated into a multi-scale mechanical network that sensitively responds to diseases. However, the translation of the mechanical response to histopathological events remains elusive. The paucity of multi-scale viscoelasticity data of biological tissue prevents, so far, a direct correlation between elastography and the tissue’s micro-architecture. 1) Micro-MRE in animal models and tissue samples provides macroscopic viscoelastic constants and histologically proven micro-architecture of the same tissue . 2) Experimental and numerical modeling of viscoelastic networks provides insight into principal interactions between structure and soft tissues mechanics [2,3]. 3) A unified view on multifrequency MRE data in multiple pathological and physiological events allows us to draw conclusions about systematic signatures of viscoelastic powerlaw constants to structural alterations of living tissue. Our group has studied by multifrequency MRE Multiple sclerosis, hydrocephalus, Parkinson’s disease, hepatic fibrosis and much more [4-6]. 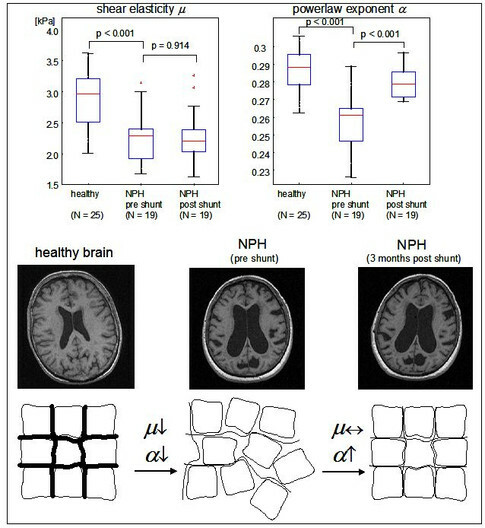 Figure: Brain tissue alteration measured by multifrequency MRE in normal pressure hydrocephalus (NPH) before and three months after shunt intervention . Riek K, Millward JM, Hamann I, Mueller S, Pfueller CF, Paul F, Braun J, Infante-Duarte C, Sack I. Magnetic resonance elastography reveals altered brain viscoelasticity in experimental autoimmune encephalomyelitis. NeuroImage: Clinical 2012;1(1):81-90. Posnansky O, Guo J, Hirsch S, Papazoglou S, Braun J, Sack I. Fractal network dimension and viscoelastic powerlaw behavior: I. A modeling approach based on a coarse-graining procedure combined with shear oscillatory rheometry. Phys Med Biol 2012;57(12):4023-4040. Guo J, Posnansky O, Hirsch S, Scheel M, Taupitz M, Braun J, Sack I. Fractal network dimension and viscoelastic powerlaw behavior: II. An experimental study of structure-mimicking phantoms by magnetic resonance elastography. Phys Med Biol 2012;57(12):4041-4053. Wuerfel J, Paul F, Beierbach B, Hamhaber U, Klatt D, Papazoglou S, Zipp F, Martus P, Braun J, Sack I. MR-elastography reveals degradation of tissue integrity in multiple sclerosis. Neuroimage 2010;49(3):2520-2525. Freimann FB, Streitberger KJ, Klatt D, Lin K, McLaughlin J, Braun J, Sprung C, Sack I. Alteration of brain viscoelasticity after shunt treatment in normal pressure hydrocephalus. Neuroradiology 2012;54(3):189-196.